Each $89 box contains 24 packs. Each pack contains 9 cards. Galactic Overlord is the spiritual successor to 2008's Phantom Darkness, the set that took everyday monsters and corrupted them into powerful Dark versions of their former selves. In Galactic Overlord, some of the most popular monsters in Dueling are reborn as "Lightray" monsters, ready to hold the line against the darkness. 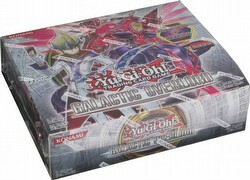 Also included is the next evolution of Galaxy-Eyes Photon Dragon (from Photon Shockwave and the '11 Holiday tins), now deadlier than ever as Neo Galaxy-Eyes Photon Dragon, the scourge of XYZ monsters everywhere, and one of the mightiest Dragons ever created. The set will also enhance Duelists' decks when combined with cards in Dragons Collide Structure Decks and Order of Chaos. There are 100 cards in the set (48 commons, 20 rares, 14 super rares, 10 ultra rares, and 8 secret rares).